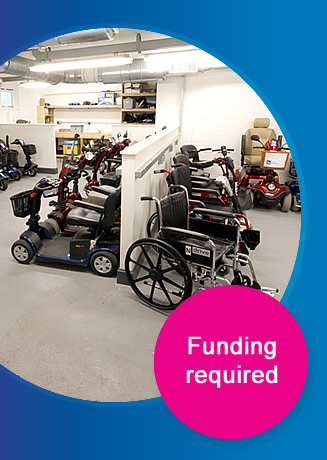 We endeavour to keep a range of equipment to meet the needs of as many people as possible. The equipment we can provide includes Scooters and wheelchairs, both electric and manual. We also have available a Maclaren buggy for our younger users. Unfortunately we are unable to allow children under 16 years of age to use our scooters and electric chairs. They can however use our manual wheelchairs. Our aim is to provide a quality service to anyone who has a mobility impairment to make getting around just that bit easier. If you want to go shopping, visit friends or go to the hospital, in and around the City Centre and find it difficult to walk then get in touch with us. Anyone who has mobility impairment can use our service. You do not have to be a Blue Badge Holder or have a permanent impairment. If you have just broken your ankle or strained your back for example and you find it difficult to get about then you can use our service. Many people use our equipment to keep up with their family or friends when shopping. They find it so much easier that they often stay in town a lot longer than they originally intended. Let our equipment take the strain and enjoy your trip. We also sell Radar keys and small mobility aids.